Red for Valentine's Day is sooo original, right? Well, if you style it MY way it is! Don't just "wear" red, be a SHOWSTOPPER in red. How? 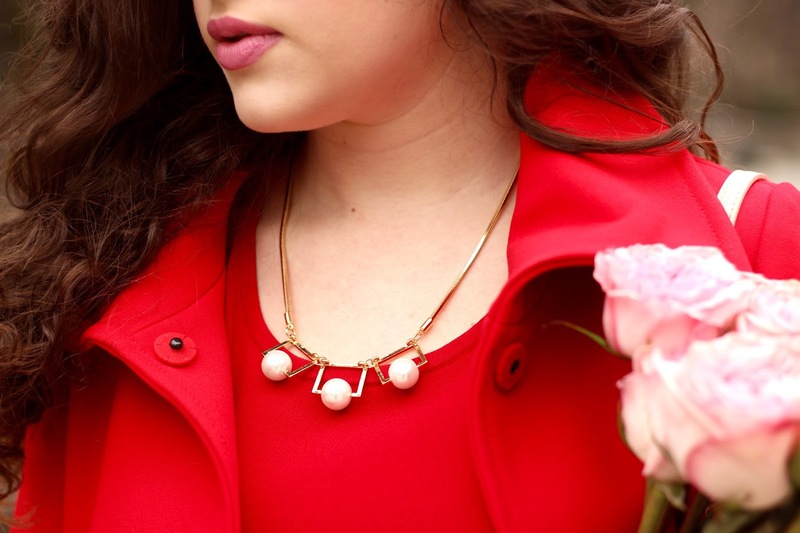 Sport the romantic hue in twofold! A monochrome look is fresh and vibrant. 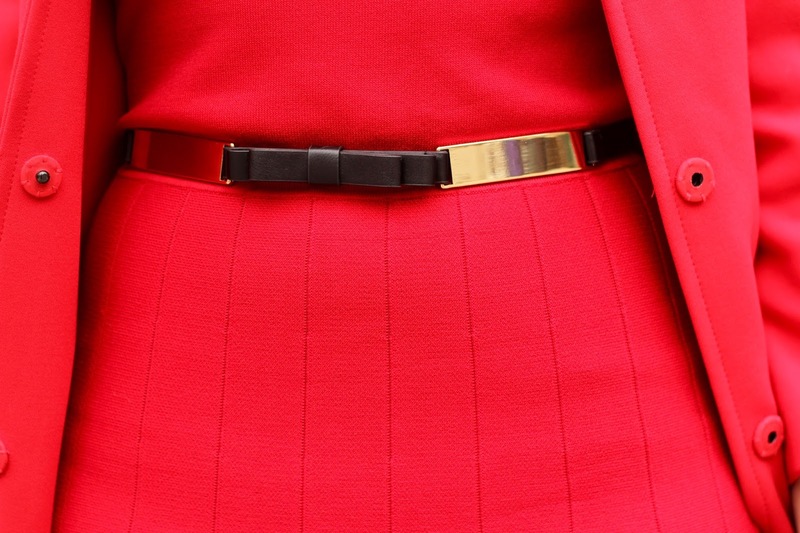 While a red dress is pretty, a red ENSEMBLE turns heads. This is the dress I layered underneath my coat. It's pretty on its own but come on, it just KILLS when paired with a red hot statement coat to match. Making a chic topcoat a part of your look is actually pretty brilliant. You may be thinking, "But what happens when I go inside and have to take it off? My outfit will be ruined!" No young grasshoppers, you are one WITH your coat in this instance (aka do not remove it). Here my outer layer acts as a blazer or a light jacket if you will. This trick works especially well for me because I'm always cold. See? Brilliance! Aren't these heels fun? There's nothing I like more than elevated basics with a creative twist, which is exactly what these are. Yes I COULD be wearing simple black pumps, but would they look as whimsical and unique? Of course not! Elevated basics always win. 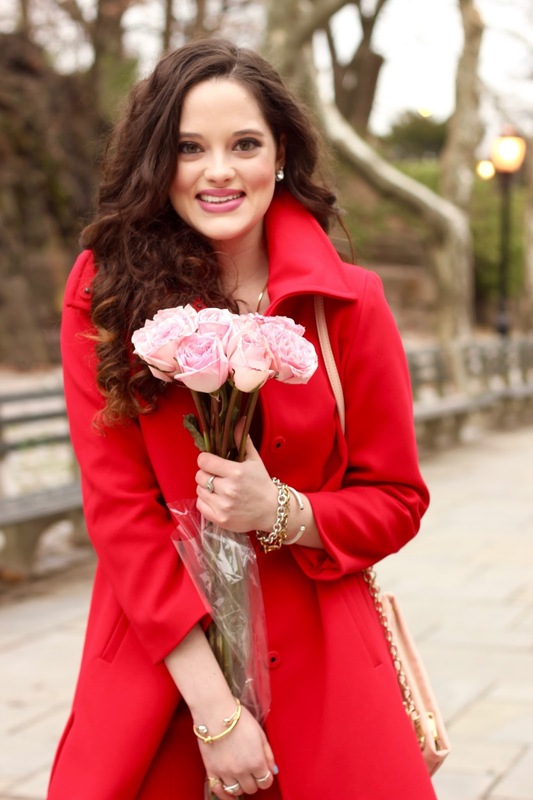 Blush and pink is a fabulous combo that has been rocking street style blogs all over NYC. So to answer your inevitable question, yes, it can most definitely be worn year round and not just for V-Day. 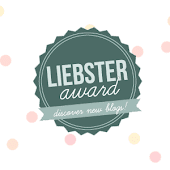 I know I know, I was hesitant at first too, but look - it's so charming! To break up the monochrome effect just a tad, and to show that I actually have a shape amidst this sea of red, I added a fancy little belt. I love this piece because it requires zero effort yet instantly polishes my look. This necklace is such a unique piece. My mom picked it out and I just love its geometric look and totally modern aesthetic. Without being overwhelming, it makes an incredible impact. And let's be real, whoever thought to put pearls in squares is a true pioneer! Pink is my jam so I decided to throw another dash of it into my look by swiping it on my lips in the form of Urban Decay lipstick. My shade of choice? "Obsessed," which is a completely fitting name. On my eyelids I gave myself a light smoky eye using Naked Smoky. You look so stunning in all red! What a knock out! So gorgeous! I love the beautiful all red look. pretty doll !!! like the style so much . SUch a lovely red look! You look incredible, love the red! And those heels are so chic! You look gorgeous! Red is definitely your color! This is darling! Those heels totally make the look! I really love the look and your twist on the look. I'm always cold too, so I feel your pain! 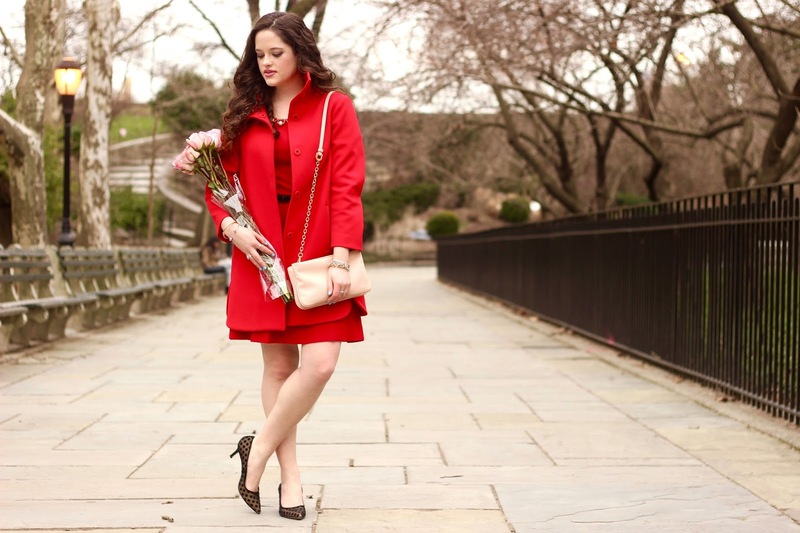 I love the simple red dress and how the red coat makes it look so sophisticated, easily transforming the look! You such cool! you look so gorgeous with red! 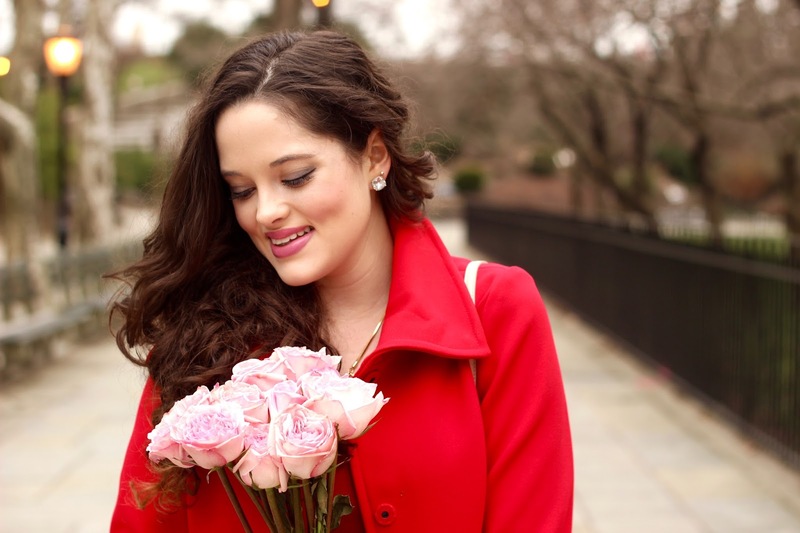 Love, love, love... you look fab in total red!!!! The only way to describe this look is fabulous. And your hair? Amazing!! Definitely a SHOWSTOPPER! You look stunning Kathleen! Have a lovely Valentines day! Love the red on red, especially with those amazing heels!! Awwww so pretty! Love the coat! You look oh so fabulous in the matchy matchy red! I think I lve each and every single item of this outfit. 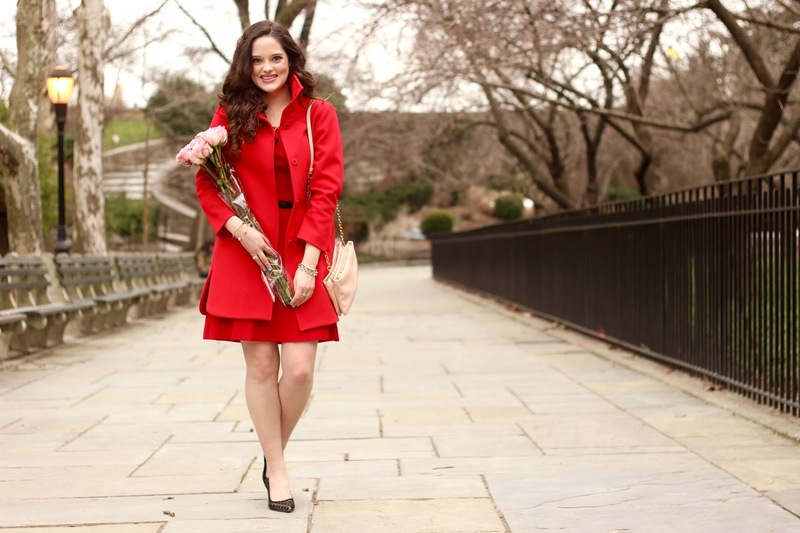 And I like your motto for this Valentines, too: "don't just wear red, be a showstopper in red". 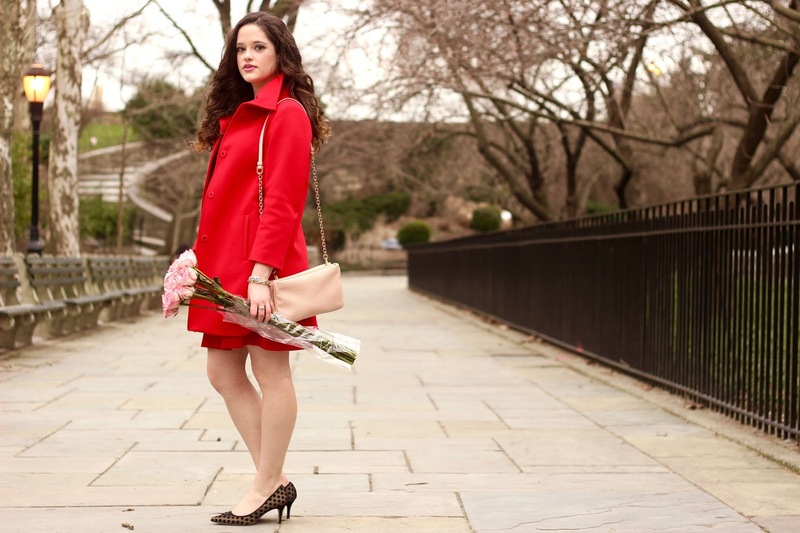 ;) The coat looks SO chic, and the dotted shoes are literally perfect for this look! Oh my this is like something from a movie, just gorgeous! Omg Kat! You look absolutely stunning! Loving the red coat on you! 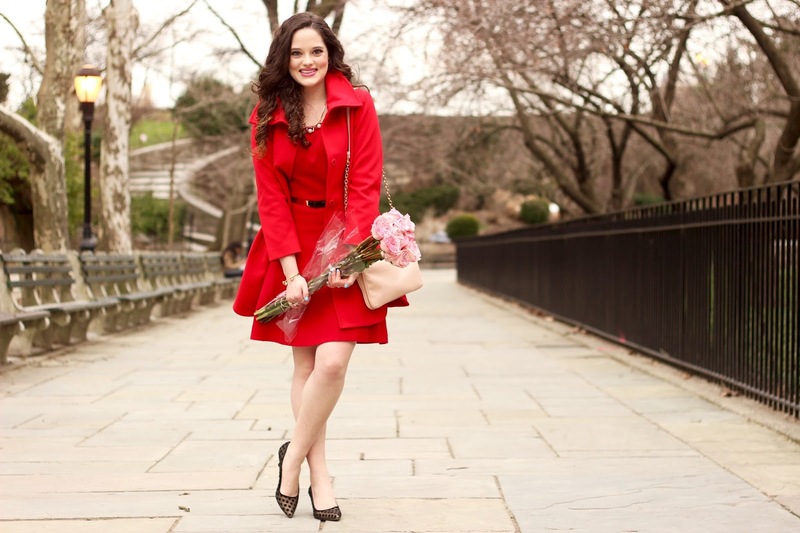 You are perfectly dressed for Valentines Kat! Very pretty! 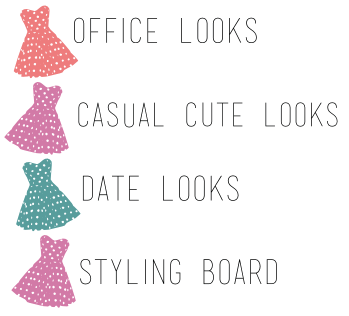 Totally gorgeous from top to toe - Have a lovely VDay weekend! You look fabulous Kat! The red dress is gorgeous and those heels are so cute! You are certainly stopping the show in this!! I don't normally love an all red look, but you are doing it right!! You are such a classic beauty! love those cute little kitten heels! adorable! Love your shoes! So cute! You look so pretty. I love it. Love, love, love! <3 Love everything about it!